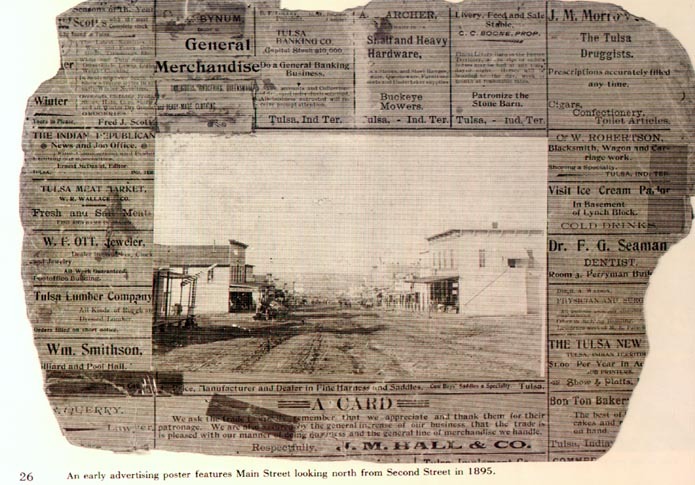 Ads that can be read: "The Indian Republican News and Job Office", "Tulsa Meat Market W R Wallace & Co Fresh and Salt Meats Fish and game in season", W F Ott, Jeweler", "Tulsa Lumber company", Wm Smithson Billard and Pool Hall", torn off "& Querry lawyer", torn off "& Bynum General Merchandise", Tulsa Banking Company", torn off "Archer Shelf and Heavy Hardware, Buckeye Mowers", "Livery, Feed and Sale Stable C C Boone Prop - Patronize the Stone Barn", "J W Morr (torn off) The Tulsa Druggist, Cigars, Confectionery, Toilet Articles", C W Robertson, Blacksmith, Wagon and Carriage Work", "Visit Ice Cream Parlor in basement of Lynch Block. Cold Drinks", Dr. F G Seaman Dentist", "Dr. R A Watson, Physician & Surg(torn off), "Bon Ton Baker", "(covered with tape) Price, Manufacturer and Dealer in Fine Harness and Saddles. Cow Boy's Saddles a Specialty.